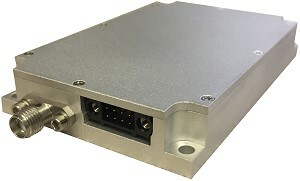 December 19, 2017: Triad has released the TTRM1190, a wideband GaN bidirectional amplifier (BDA) that operates from 30 MHz to 2700 MHz and produces over 8 W of TX power. One of the smallest BDAs in the industry measuring only 3.25 x 2.12 x 0.53 inches, this feature rich BDA is also one of the most efficient. While producing 8 W of RF power, it only consumes 24 W of DC power. It also produces over 2 W of linear 16 QAM with < 9% EVM. In order to operate on various existing platforms, the unit features a wide DC input range of +11 to +28 VDC. Switching between TX and RX at less than 1 μsec can be performed manually while base plate temperature can be monitored via an analog temperature sensor. This class AB GaN module is designed for both military and commercial applications. It is capable of supporting any signal type and modulation format, including but not limited to 3 - 4G telecom, WLAN, OFDM, DVB, and CW/AM/FM. The latest device technologies and design methods are employed to offer high power density, efficiency, and linearity in a small, lightweight package.